View a map showcasing where our Washington State Ferries travel. Exit maps for Washington state routes. Search for bridge heights along your route. 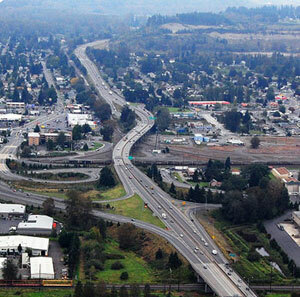 View and print drawings of state highway interchange areas. Instant access to a wide variety of data driven map content. Dynamic "driver's seat" views of the state highway system, selectable by milepost. Inventory tool for locating geodetic control monuments. A centralized distribution site for geographic information system data. Interstates and other principal arterials that are needed to connect major communities in the state. Searchable collection of research reports. State highway log, functional classification, highway Performance Monitoring System, interchange viewer and digital imagery & duplication services. Monthly and annual traffic reports, bicycle and pedestrian count, speed report, peak hour and Traffic Data Geoportal.